Snapchat celebrities are making undisclosed paid endorsements. Even more than on other platforms, policing them is a major challenge. 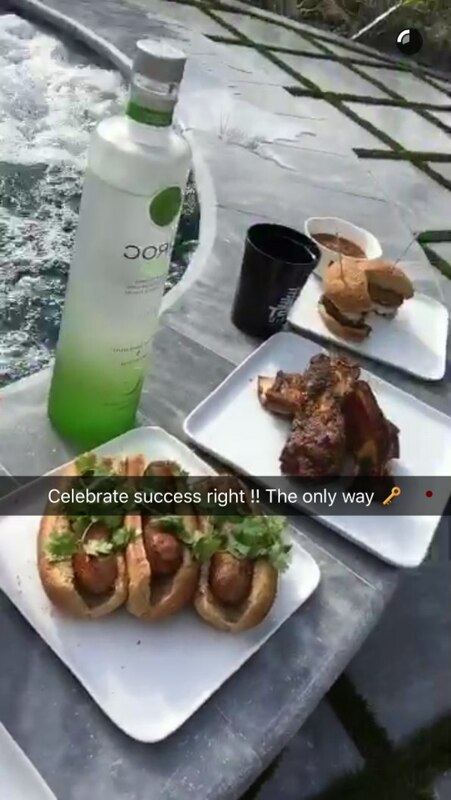 No one has been more influential to Snapchat culture than DJ Khaled. An Adweek cover story on the famous rapper deemed him the “King of Snapchat” in February. One month later, Emmanuel Seuge, senior vice president for content at Coca-Cola, called him the same in a cover story in Bloomberg Businessweek. Sometimes, that reality show includes product placement. His product of choice? Apple Ciroc vodka. Khaled has actually been promoting the brand for years. His 2010 music video for “All I Do Is Win” is basically one long Ciroc ad. It’s difficult, though, to find exact details on his relationship with Ciroc. Fellow rapper Sean “Diddy” Combs became a brand ambassador for the alcohol back in 2007, and the two have appeared in promotional materials together. The only evidence that he’s also a paid brand ambassador, however, comes from a Twitter marketing case story which has since been removed. (DJ Khaled’s representatives and Ciroc both did not respond to requests for comment). That’s not the only confusing relationship between Khaled and a brand. It can be difficult to tell the difference between what products he’s paid to promote and what products he organically brings up (or, more likely, wants sponsorship deals from). Here’s a video, for example, of him talking about Dove brand soap (starts at 0:15). There are plenty of other examples. The Adweek cover story references his love of Listerine and Palmer’s Cocoa Butter, with which he says he has no relationships. The dating app Bumble is another brand that Khaled has promoted, though the details of the relationship remain unknown. The problem is that the snaps are difficult to find. DJ Khaled has millions of followers, but any record of his activity, beyond a few compilation videos, is mostly lost. Snaps, of course, disappear after 24 hours. Unless someone records them or takes screenshots, they’re gone forever. Snapchat’s transitory, one-to-one nature is a big part of its appeal. But the platform’s ephemeral content is also something of a nightmare for regulators forced to keep up with a rapidly evolving digital landscape. The past few years have seen a dramatic rise in the popularity of person-to-person chat apps such as Snapchat. WhatsApp, Facebook Messenger, Kik, and others are critical to how the world—teens especially—communicates on the internet. Celebrities, brands, and publishers, predictably, have followed users there. Meanwhile, influencer marketing—a form of native advertising in which a digital “influencer” is paid by a brand to promote a product—has become an increasingly valuable part of many advertisers’ repertoires. But that hasn’t come without growing pains. The FTC released new guidelines in December 2015 that took aim at native advertising, asking all campaigns to include clear disclosure language such as “Promoted” and “Ad.” Recently, the FTC has begun enforcing those guidelines to send a message to the native ad community. Last month, it sanctioned Warner Bros. for a campaign with famous YouTuber PewDiePie. Of course, PewDiePie’s videos are easy to find. DJ Khaled’s snaps, on the other hand, have disappeared from the digital ether. That raises an important question: How are regulators supposed to regulate platforms with private, fleeting ads? The FTC was created in 1914 by President Woodrow Wilson. At the time, its primary purpose was enforcing antitrust laws and breaking up monopolies. Since then, its responsibilities have evolved to enforcing consumer protections against deceptive marketing and advertising practices. In 2000, the FTC found that “a low 20% compliance with applicable laws among internet-based businesses.” Only 52% of Americans were on the internet back then; today, that number has risen to 84%. As more Americans spend more time on the internet—and as the digital landscape changes dramatically month to month—the FTC may be facing its biggest challenge since its early role as a monopoly buster. One out of four influencers are asked not to disclose by their sponsors. The FTC can do little on its own. According to Engle, the agency has to rely on complaints from consumers and watchdogs when it comes to social media marketing. “[It’s] not possible to monitor all social media marketing, obviously,” she said. And for transitory platforms such as Snapchat, oversight is even more difficult. “People would have to take a screenshot in order to alert us to something,” Engle said. If the FTC opens an investigation, it requires advertisers to submit their marketing material, which they may or may not have on record. On Snapchat, photos can last as little as three seconds—barely enough time to take a screenshot, assuming that consumers are even aware that an ad doesn’t comply with FTC regulations. Even then, consumers may not know the FTC is largely reliant on them to call out deceptive marketing. Considering that one out of four influencers are asked not to disclose by their sponsors, according to a recent study by influencer marketing platform SheSpeaks, the result is a game of Whac-A-Mole—except consumers don’t even know they’re playing. Like on Instagram, where the most-liked picture of all time is an undisclosed Coca-Cola ad by Selena Gomez, many influencers on more private platforms like Snapchat are simply unaware of the regulations—and some brands have done a poor job of educating them. As private platforms like Snapchat, Messenger, and Kik become more popular, an already stretched-thin FTC may find it impossible to enforce its regulations. But influencers like DJ Khaled have already shown they’re open to disclosures: The rapper regularly tells his audience to drink responsibly. He even told Adweek that promoting responsible drinking is a “major key” to him. Now, the question is whether the FTC and advertisers can educate a new breed of influencers to make disclosures a major key as well.